Authentic Archery Tag® and S.A.F.E. Archery® equipment is only sold directly from Global Archery Products, Inc. in Ashley, Indiana, USA. Authentic Archery Tag® equipment is only sold through our dedicated sales team and website, ArcheryTag.com. Archery Tag® is a registered trademark and has several patents on the unique design of our equipment. 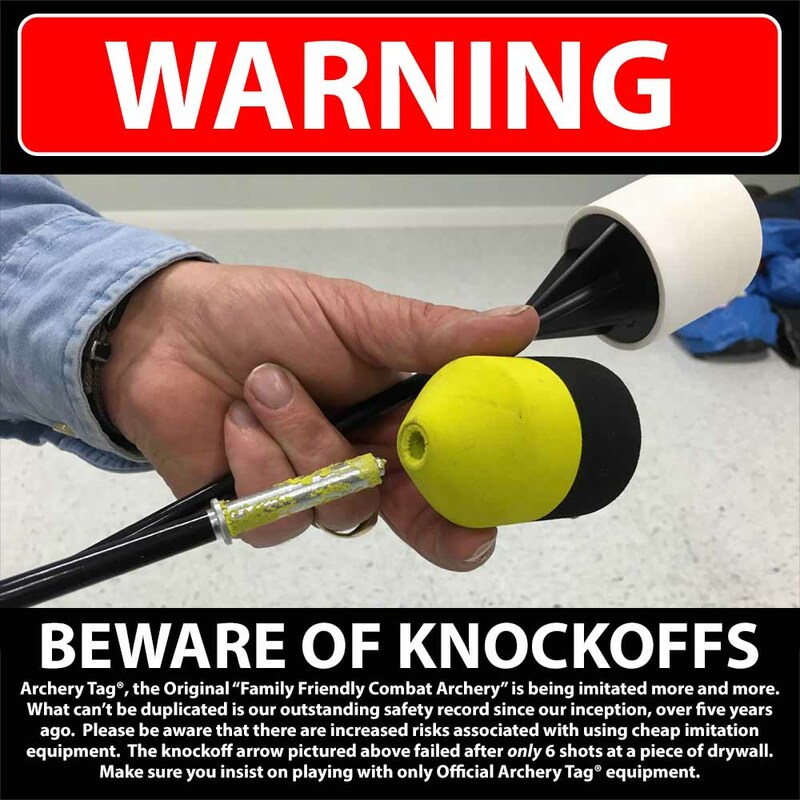 If you find websites, receive email or phone calls from anyone claiming to be able to sell you Archery Tag® equipment, they are trying to sell you knockoffs. They are putting you and your customers at risk. If these people contact you, please get as much information from them as possible and let us know at info@archerytag.com so we can forward your concerns to our legal team. Our goal is to provide a safe and fun archery experience for everyone. We invested in specific equipment to test our bows and arrows to make sure they are as safe as possible. We also utilize outside labs and Universities for testing. Above all, we have years of our products being used by you, our customers. In those years, we've listened to suggestions and made improvements to our designs and manufacturing techniques. Nobody else has the time or experience that we do. Don't be fooled by cheap knockoffs. There are big differences AND big risks. Buy ONLY authentic Archery Tag® equipment.